I've subscribed to plated.com which is a service that "delivers everything you need to create chef-designed recipes, making it simpler and more fun to cook at home." Each week I receive a well-packed, well-insulated box with three different meals (6 portions). 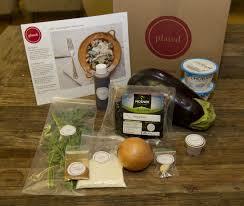 You can select your menus for each shipment or let plated.com ship you a surprise. Last night we had Sautéed Shrimp with Tomato-Bacon Gravy over Creamy Grits. It was perfect. Very quick and easy to make. The meals range from $12/plate-$24/plate depending on what you order. Other recent winners were Balsamic-Glazed Sirloin with Pesto Potatoes, Charred Leeks, and Mustard Aioli; Cedar-Wrapped Salmon with Shiitake Slaw and Graffiti Eggplant; Orecchiette with Spinach Pesto, Fresh Mozzarella, Tomatoes, and edible flowers, to name a few. Each meal arrives with all ingredients wrapped in a plastic bag. Everything needed to make the dish is included with the exception of salt and pepper, olive oil and cooking utensils. The recipes tend to be relatively easy considering they are unique with unusual sometime exotic ingredients. The bulk of the time to prepare the meals is the preparation of the vegetables (dicing, mincing, etc). Each menu has a letter-size recipe card with color (see photo) photos and thorough preparation and cooking instructions. There are at least two other online competitors but I haven't tried. 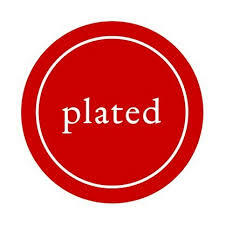 Plated.com literally and figuratively spices up your life.